Often touted as the biggest attraction around Albufeira, the Zoo Marine Algarve water park is situated in Guia, a couple of kilometres from the city. Block a whole day in your roster for this park! It offers you much more than the average water park experience with a myriad tropical fish, seals, sharks and dolphins as well as tropical birds and birds of prey from across the globe showcased here in all their glory. The shows are captivating and many a visitor has noticed how the animals here are treated with much more sensitivity and care than any other water park they have visited. A fascinating journey for adults and children alike, this is a great place to spend some time with your family as you encounter wildlife, and learn about its conservation; the whole experience enhanced by the use of top-notch technology.Using digital 4D animation, the Zoo Marine Algarve water park uses technology innovatively to amplify the visitors’ experience. The Aquarium-Museum lets you explore the vaguely ominous world of sharks through 20 different eco-systems, and there is also a dolphin swim that you can embark upon - a well-organised operation that is professionally carried out that lets you actually get in the water with these gorgeous, intelligent animals. The dolphin trainers are friendly and collaborative and are happy to tell you more about the dolphins and their training. The park also runs a rehabilitation centre that works on reintroducing a range of marine species into their natural habitat, with the assistance of a team of professionals and volunteers. This Algarve water park places a decided emphasis on an educational philosophy without compromising on the fun factor, making it a very wholesome pick. Cherry on the cake - the park is well organized and very easy to navigate, with all the attractions scattered out in spacious grounds surrounded by lush lawns, swimming pools and palm trees. There is a transport service within the park and well-equipped changing rooms and showers. Wheelchair rental, kiddy car rental are available. Refreshment kiosks and a well-stocked gift shop offer you a breather and the souvenirs here are great. The facilities provided here like the food and toilets are clean and decent(the former being a little overpriced), and there is the opportunity to relax on the beach if you want so make sure to carry swimwear. There are lockers to leave your belongings in. The dolphins’ special is not particularly cheap and bear in mind that it requires advance booking if you’re really keen on it! Free for Children at a height under 1 metre. Online tickets purchased 30 days prior to the visit can avail of a 20% discount. With the family pack ticket, you can buy 2 normal tickets online and get 1 free ‘junior’ ticket, for visits to the theme park. Zoo Marine is around 9 miles by road from Olhos D'Agua. A taxi will cost you around 15 - 20 Euros, booking in advance is required for return. Taking an early bus out from Albufeira is the best choice as you can get to spend the whole day here, and return buses from the park start post-4PM. You can book tickets and transport locally at one of the ticket centres in the city. 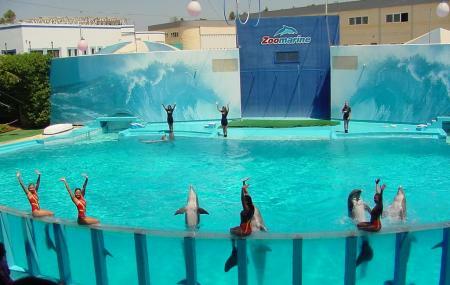 How popular is Zoo Marine Algarve? People normally club together Praia Gale and Hot Wheels Raceway while planning their visit to Zoo Marine Algarve. We loved it here. Dolphin show was unreal. With lots to do also. The pools.were great. A couple of the rides.and.shows were under repair when we were there.. fully opened expect two days to do everything. Bring towels and spare clothes and a packed lunch.. This place was amazing. The entry fee covered all the park has to offer, all water activities, rides and shows. Eating in the park was inexpensive as well. The price to use their lounge chairs is fair because it pays for all day use at anywhere around the park... just hold on to the receipt whenever the chair attendant comes by to collect the money. Went in April, it was 90% open and just nice - no big queues for anything. It was a marine conservatory (first in Portugal) and it does have a strong conservation theme running through it. It’s not a zoo however, and the shows are a very much circus-like (though entertaining). Lot’s of variety and fun for younger kids, and not a place you have a lot of wild older teenagers throwing themselves around. I love this park. I've been here many times. There is so much fun stuff to do. The staff are great and the choice of animals to see are too!